LONDON - A Cambodian rebel leader says a Vietnamese offensive against his troops has been blunted and is unlikely to be resumed because of the imminent rainy season in Indochina. The 72-year-old politician, Son Sann, who heads the rebel coalition opposed to the Vietnamese-backed Heng Samrin government in Phnom Penh, asserted here Thursday that his forces had turned back a major assault on his headquarters camp at Ampil, near the Thai border. The anti-Vietnamese guerrillas have seven such camps in Cambodia from which they made hit-and-run attacks on Heng Samrin's superior forces. Speaking in an interview in the basement cafetaria of a shabby hotel off Cromwell Road, Son Sann denied reports that Ampil had been captured. He said the Vietnamese push begin April 15, with 105-, with 122-, and 133- millimeter artillery fire and human-wave attacks that overran a forward position at Ampil Lake, three miles away. But a secondary line defense about two miles from Ampil has been held, he asserted, despite continuing intense artillery and mortar barrages. On one day, more than 1,000 rounds were reported fired. In addition, the frail, courtley politician said opposition forces under Col. Prum Vith won a significant victory around the camp of Son Sann, farther south. 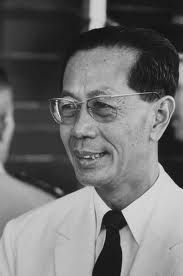 Son Sann is president of the Khmer People's National Liberation Front, a pro-Western opposition group allied with the non-Communist party headed by Prince Norodom Sihanouk, the former head of state, and with the pro-Peking Pol Pot forces, which were removed from power by the Vietnamese in 1979. A Cabinet minister under Sihanouk, Son Sann is also the prime minister of the coalition's government and heads its four-man military coordinating committee. He asserted that his organization has 13,000 men under arms the relatively well-armed Pol Pot forces claim 35,000 to 40,000 fighting men, and Sihanouk's forces, which have not been seen in action recently, are thought to number up to 5,000. The three groups independtly, waging their own campaigns under their own commanders, but the coalition's international standing has been hurt by its identification with the Pol Pot forces, who have been accused of mass murder in their fofur years od rule. The association of Southeast Asian Nations, a non-Communist alliance, has backed the coalition, but the French foreign minister, Claude Cheysson, repudiated it in March when, during a visit to Bangkok, he said it had not furthered the search for peace. No Western country is known to have supplied Son Sann with weapons. In a foreign tour that month, the Vietnamese foreign minister, Nguyen Co Thach, agreed in talks in Melbourne with his Australian counterpart, William G. Hayden, to negotiations without conditions between the Asean countries and Hanoi. But nothing more has been heard on the subject, and Son Sann expressed great dubiousness. "I don't believe it," he said, " and I won't start believing it until the Vietnamese start conforming their actions to their words." Now in the midst of a resumed European trip that he interrupted to return home when the Vietnamese attacked. Son Sann met last week with the British foreign secretatry, Sir Geoffrey Howe. He was scheduled visits to Bonn and Paris, seeking support in those capitals. But his main hope is pinned on the United States and China. When President Rragan arrived in Peking late last month, the Cambodian rebel leader issued a statement appealing for aid, particularly small-arms ammunition and heavy infantry weapons, of which his troops are woefully short. He conceded in the interview that "every time we have a major fight with the Vietanmese, we run out of ammunition." In hia appeal, Son Sann said his forces wanted to restore "independence, sovereignity, neutrality ad nonalignment to Cambodia." He added: "Ample words have been spoken. Clear-cut intentions have also been revealed. It is high time to convert words and intentions into actions."